When creating a new shower space with tile, the key considerations are overall beauty, coordination with other parts of the bathroom, and ease of cleaning. For shower floors, two additional factors become essential. These are drainage slope and a non-slip texture. As a result, different tile dimensions may be appropriate for the walls than for the floors. Just about any non-porous tile material can be used for shower walls. Porcelain and slate are among the most popular materials. While any sized tile will work for the walls, shower floors demand a different set of considerations. In the first case, shower floors need to angle toward a drain to ensure all water flows away quickly without standing on any part of the shower floor surface. Large tile pieces will not work for this purpose, so smaller, even mosaic-type tiles, are best. Secondly, excellent traction is a major requirement for a safe shower area. Larger tiles do not provide much traction. Tile pieces for floors should be no larger than 4”x 4” although smaller pieces are even safer. Having different sized tiles for floors and walls is just another exciting design opportunity. Once the wall style and the flooring throughout the rest of the bathroom have been determined, the smaller shower floor tiles can be selected to complement the predominant colors and textures. PetraSlate Tile & Stone of Denver offers small shower floor tiles of similar color, material, and texture as most of their larger wall options. In many cases, the choice of design may be sufficiently different to provide a pleasing contrast and coordination. For example, travertine wall tile can be complemented by a smaller, similarly colored 2” x 2” floor tiles. Other options are possible. 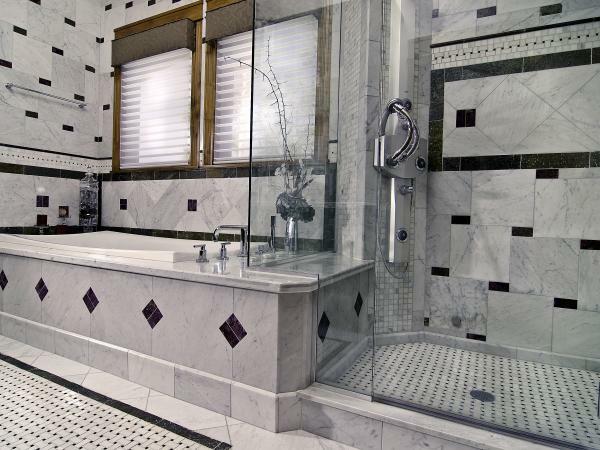 The homeowner may choose the same small tile for the shower walls as for the floor. Or, as another decorative choice, the entire bathroom floor might incorporate the same non-slip smaller tiles as the shower. For nearly three decades, PetraSlate Tile & Stone has provided top quality wall and floor claddings throughout Colorado for a range of exterior and interior projects. PetraSlate has chosen to work only with world-class manufacturers to provide quality materials to ensure home and business owners have a beautiful, captivating, and durable surfaces throughout. Check out the PetraSlate website for fresh ideas and contact the experts at PetraSlate for more information at (303)-280-9595.